You are here: Home / Faith / And they may call him "Blessed"
And they may call him "Blessed"
Oh, our beloved Pope John Paul II. A little more than three years ago, I shared my favorite JP2 memories. What a man. What a Pope. What a soon-to-be saint! Scott and I were blessed to see him nearly a dozen times from 2000-2003. Some of the sightings were quick (at his apartment window late one night as he waved to a few singers in the square and a quick motorcade drive by late, late one night after our dinner in Rome). But, others. Other times we spent hours listening to him. There was the first Papal audience in St. Peter’s Square. It was unbelievable. There was the canonization of Padre Pio. Yes, us and 9 billion (ok, maybe a little exaggeration, but it was KAH-razy) other pilgrims crammed into St. Peter’s Square on a very hot June day and witnessed history. There was the prayer Vigil and Mass at World Youth Day in Toronto. That one still makes me tear up when I think of it. We had seen him just a month before in Rome and he looked so frail. When he arrived in Tornoto he was not the same man. Youth invigorated and inspired him as much as he did them. There have been Sunday Angelus’ and more Papal audiences. Each time I wondered this: is this the last time we’ll see JP2? I was reminded that being in his presence was a tremendous blessing. As a non-Catholic, I had a hard time understanding what was so exciting about the Pope. When I became Catholic and learned about the church’s history I began to see and understand the papacy. The disciple Peter was the first Pope. Every Pope since then follows in the line of the succession of St. Peter. These men weren’t chosen by man, but rather by the Holy Spirit. I am grateful beyond words that I was given so many opportunities to be in the presence of the Holy Father. As he reflected on scripture during his audiences and Masses, I was inspired to change. To change the way I love my husband. To change my views on artificial birth control. The death penalty. Social justice. Wars. Famine. Injustice. 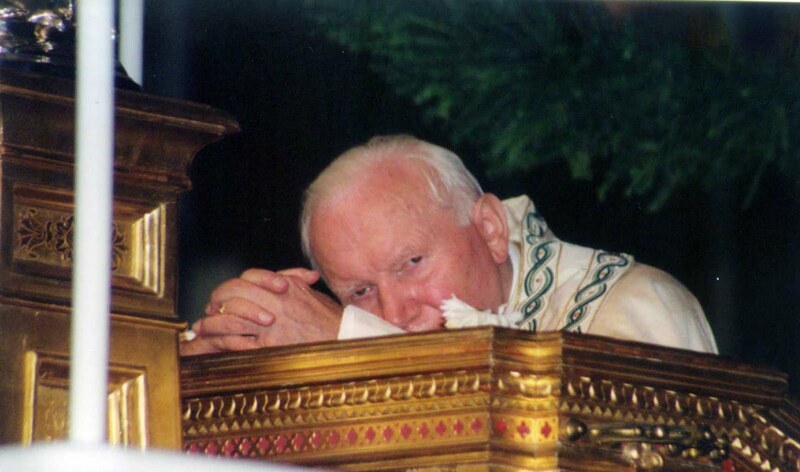 The John Paul II Generation isn’t a cliche, I’m a proud member. His teachings, compassion and love will affect generations of Catholics. I’m honored to be one of them. Couldn't say it any better! Can't even mention his name around here without instant tears. So Blessed to have seen him!